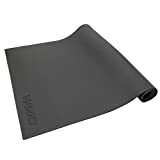 Stop equipment from sliding on slick floor surfaces and shield your floors from potential damage such as denting and scratching with the Viavito PVC fitness equipment floor mat. Not only does it protect floors from damage, this mat will also decrease vibrations and noise when using fitness machines or equipment. Its long 220cm length and generous 110cm width mean it will comfortably go underneath pretty much all treadmills, rowing machines, cross trainers, exercise bikes, vibration plates and other similar pieces of fitness equipment. This Viavito mat is a high-quality option that is 6mm thick, easy to clean, strong and long-lasting, and will also give a nice appearance in your home.